There are many methods of operating a sanitary landfill. 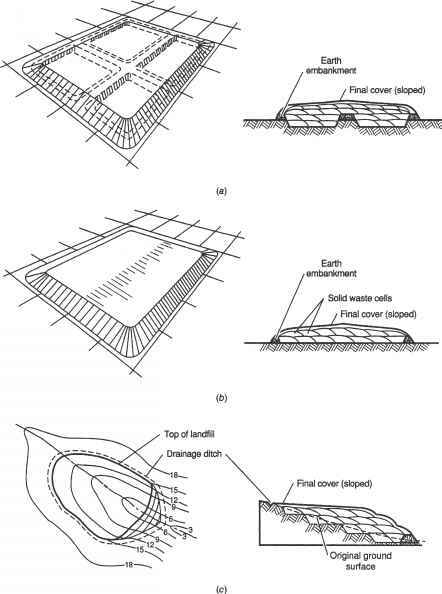 The most common are the trench, area, ramp, and valley fill methods, as illustrated in Figure 3.24. These landfill methods are described as follows. With the regulatory requirements for constructed liner and leachate collection and removal systems now imposed by the EPA as set forth in RCRA, a defined operational area and well-designed operational plan are essential and must be closely followed to ensure an efficient and environmentally sound operation. Trench Method The trench method (see Figure 3.24a) is used primarily on level ground, although it is also suitable for moderately sloping ground. In this method, trenches are constructed by making a shallow excavation and using the excavated material to form a ramp above the original ground. Solid waste is then methodically placed within the excavated area, compacted, and covered at the end of each day with previously excavated material. 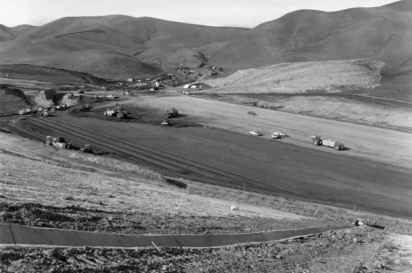 Because of the need to install landfill control measures (e.g., liners), a number of trenches are typically excavated at one time. Trenches are made 20 to 25 feet wide and at least twice as wide as any compacting equipment used. The depth of fill is determined by the established finished grade and depth to groundwater or rock. If trenches can be made deeper, more efficient use is made of the available land area. Benchmark—Survey benchmark measured from U.S. Geological Survey benchmark established on-site and landfill cells referenced to it; a benchmark for each 25 acres of landfill. Bottom liners —As specified by the regulatory agency and as indicated by the hydrogeological survey. See Figure 3.27. Distance from any surface water—Based on soil attenuation, drainage, natural and manmade barriers, but not less than 100 feet, preferably 200 feet or more. Equipment—Adequate numbers, type, and sizes; properly maintained and available. Equipment shelter —Available for routine maintenance and repair. Flood plains—No solid waste management facility permitted unless provisions made to prevent hazard. Gas control—Prevent hazard to health, safety, and property; provide vents, barriers, collection, monitoring. Gas monitoring is required, also for volatile organic chemical and toxic emissions. See Figures 3.34 to 3.35. 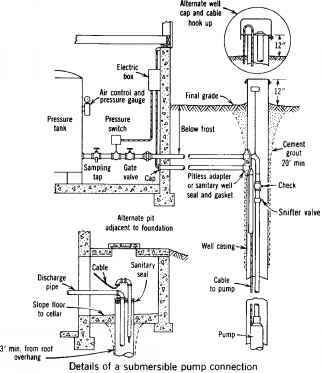 Discharge Elimination System, and shall not contravene groundwater quality standards. Leachate collection system maintained. Limits of fill —No closer than 100 feet from boundary lines of property. Restrictions primarily on proximity to water supply aquifers, wellhead areas, wetlands, floodplains, and surface waters. Monitoring wells—Four or more at new or modified facility; at least three located down gradient for a small site. Regulatory agency may require wells at existing facility. Off-site wells may be used. Wells must reflect groundwater flow and quality under the landfill site. • Water monitoring may be required. Safe Drinking Water Act MCLs are used to determine pollution and evaluate pollution travel. • Baseline water quality and annual seasonal data are required at a new site and some existing sites. Plans and construction—Engineering plans and specifications as required and approved by regulatory agency. Construction under supervision of project engineer who certifies construction is in accordance with approved plans and specifications. Site —A hydrogeological survey of the site and surrounding land, soil borings, permeability, and groundwater levels. Check with Federal Aviation Administration. Termination —Prevent contravention of surface water, groundwater, and air-quality standards and gas migration, odors, vectors, and adverse environmental or health effects. At least 2 feet final cover, including an impervious barrier and gas-venting layer, along with an upper grass cover crop; 4% slope to minimize infiltration, prevent ponding and a surface water drainage system. Vertical separation —five-foot separation between bottom liner and high groundwater. If natural soil is equivalent to 10 ft of soil with coefficients of permeability less than 5 x 10-6 cm/sec, separation may be reduced if a doubleliner system is provided; 10-ft vertical separation required to bedrock. Access —Permitted when attendant on duty; controlled by fencing, signs, or other means. Compaction and cover —Solid waste spread in 2 feet or less layers and promptly compacted. Working face minimal. • Ten feet of maximum lift height. • At least 6 in. daily cover at end of each day, or more often. • At least 12 in. intermediate cover if solid waste not deposited within 30 days. • Surface water drainage control during operation. • Final cover when additional lift is not applied within 1 year; when final elevation is reached and within 90 days; when a landfill is terminated. Capped as required by regulatory agency. See Figure 3.37. Hazardous wastes —No industrial or commercial solid waste or septage, or other materials producing hazardous waste, without specific permit authorization. No bulk liquids or 55-gal drums filled with liquids. Litter and papers—Confined by fencing or suitable means. Vehicles confining papers and litter to be admitted. Maintenance—Cover material and drainage control designed and maintained to prevent ponding and erosion, and to minimize infiltration, based on a 25-year storm and from a 24-hour, 25-year storm. Prepare a landscape plan. • Grass or ground cover established within 4 months and maintained. • Soil cover integrity, slopes, cover vegetation, drainage, groundwater and gas monitoring, and structures maintained for a period of 30 years or longer. • Leachate collection and removal system, inspection manholes, and lift stations maintained operational as long as necessary. • Liner leakage monitored and reported to regulatory agency. • Establish a trust fund, surety bond, insurance, etc., to ensure long-term maintenance. Noise—Shall not cause excessive sound levels beyond property lines in residential areas. Level 7 a.m.-10 p.m.: rural 60 dBA, suburban 65 dBA, urban 70 dBA. Level 10 p.m.-7 a.m., rural 50 dBA, suburban 55 dBA, urban 60 dBA. On-site roads —Maintained passable and safe. Open burning —Prohibited except under permit. Personnel shelter —Adequately heated and lighted; includes safe drinking water, sanitary toilet and shower facilities, telephone or radio communications. Reports —As required in permit. Small loads —Separate facility (convenience station) at the site for use of local residents and small trucks. Solid waste disposal —Confined to an area effectively maintained, operated, and controlled. 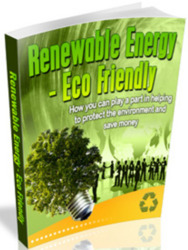 No industrial, commercial solid waste, no sludge or septage unless specifically approved. Inspection for hazardous waste required. Supervision —Operation supervised by a certified operator, including dumping sequence, compaction, cover, surface drainage. Vectors, dust, and odors —Controlled to prevent nuisance or hazard to health, safety, or property. Weigh station—For weight measurement, fees, and waste inspection. Note : See also applicable federal and state regulations. Source: J. A. Salvato, Environmental Engineering and Sanitation, 4th ed., Wiley, New York, 1992.
limited area, and avoid scattering of debris. In the area method, cover material is hauled in from a nearby stockpile or other source. The base of the landfill is established by the previously determined elevation of bedrock, groundwater, and bottom liners and leachate collection and removal systems. Valley or Ravine Area Method In valleys and ravines, the ravine method (see Figure 3.24c) is usually the best method of operation. The development of a large ravine landfill site is illustrated in Figure 3.25. In those areas where the ravine is deep, the solid waste should be placed in "lifts" from the bottom up with a depth of 8 to 10 feet. Cover material is obtained from the sides of the ravine. It is not always desirable to extend the first lift the entire length of the ravine. It may be desirable to construct the first layer for a relatively short distance from the head of the ravine across its width. The length of this initial lift should be determined so that a one-year settlement can take place before the next lift is placed, although this is not essential if operation can be controlled carefully. Succeeding lifts are constructed by trucking solid waste over the first lift to the head of the ravine. When the final grade has been reached (with allowance for settlement), the lower lift can be extended and the process repeated. The bottom landfill liner and leachate collection and removal system must be designed carefully to ensure that slope stability of the liner system and the waste placed is adequately maintained. FIGURE 3.25 Development of large ravine landfill site. Equipment is compacting subbase of landfill in preparation for placement of geomembrane liner. How to calculate sanitary landfill by trench method?